Wobble Wag Giggle Reviews: Do Dogs Love It? Review of the Wobble Wag Giggle, a toy ball for dogs which produces sounds when set in motion. It is said to be designed to hold the attention of dogs better than standard toys. 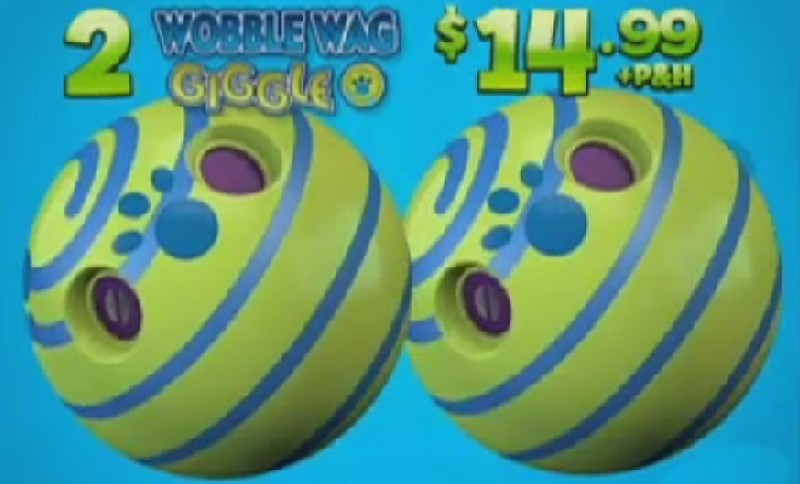 Wobble Wag Giggle Ball is an As Seen on TV pet toy marketed on television. The ball is constructed of sturdy vinyl, and is covered with six “clutch pockets” which allow canines of various sizes to pick up and carry it. When nudged, rolled, or shaken, the ball emanates sounds which supposedly emulate human laughter (hence the word “giggle” in the name). These sounds, along with the ball’s color and movement design, are supposed to hold the instinctual attention of dogs. Wobblewagiggle.com is the official product website. Wobble Wag Giggle Ball is available to order from the product website. The website currently features a double offer (two Wobble Wag Giggle Balls) that customers apparently can not opt out of. Customers are simply asked, “How many Double Offers would you like?” Setting the quantity to zero fails to activate the site’s shopping cart. Large size: (Originally recommended for dogs over 40 pounds, but that recommendation is now longer shown) (5.5″) – $14.99 plus $6.95 P&H and an additional $4.95 for the Double Offer = total of $26.89. A sales tax is added to orders shipping to California, Connecticut, Nevada, and New York. Orders originating in Canada, AK, GU, HI, PR and/or VI are subject to a $10.00 surcharge. Purchase of the Wobble Wag Giggle Ball comes with a 30-Day Money Back Guarantee which does not include a refund of P&H charges. We have seen Wobble Wag Giggle in stores for about $15. Overall, user reviews of the Wobble Wag Giggle Ball are somewhat mixed. Potential shoppers may want to browse additional reviews of this product on Amazon and the HSN website to decide if the toy is right for their pet. With over 700 customer reviews at Amazon, it has a 3.5 star rating as of January 2016. Some claim that their dogs were able to destroy or tear holes in the Wobble Wag Giggle Ball. Some claim that their dogs were frightened by, or indifferent to, the Wobble Wag Giggle Ball. A small number of pet owners have reported that smaller dogs had difficulty grasping and carrying the toy. Another point of contention from some consumers is the ordering process on the website, and the fact that you can’t opt out of the “Double Offer” – meaning you must pay a total of $11.90 in non-refundable shipping. This problem can be avoided by simply purchasing the product at a local retailer. Below is a video review of Wobble Wag Giggle. Wobble Wag Giggle Ball is a dog toy that creates sounds that resemble giggling when it is played with. Online reviews of the ball seem to be considerably varied. It may be best suited for nondestructive dogs that enjoy toys which produce noise. We recommend purchasing locally to avoid shipping charges and delays, and to give you a chance to evaluate the product more closely before making your final purchase decision.